Nick Schultz | The Phoenix Loyola sophomore forward Christian Negron throws down a dunk. 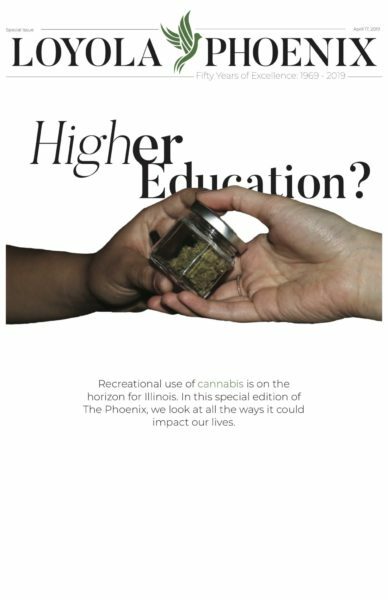 Nick Schultz | The Phoenix Loyola redshirt senior guard Marques Townes calls out a play. 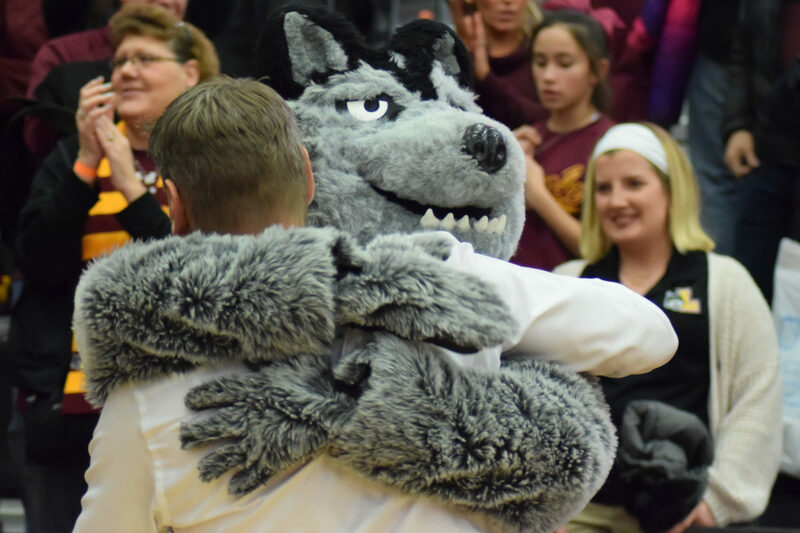 Nick Schultz | The Phoenix Loyola head coach Porter Moser hugs LU Wolf after Loyola's win over Southern Illinois Jan. 27. 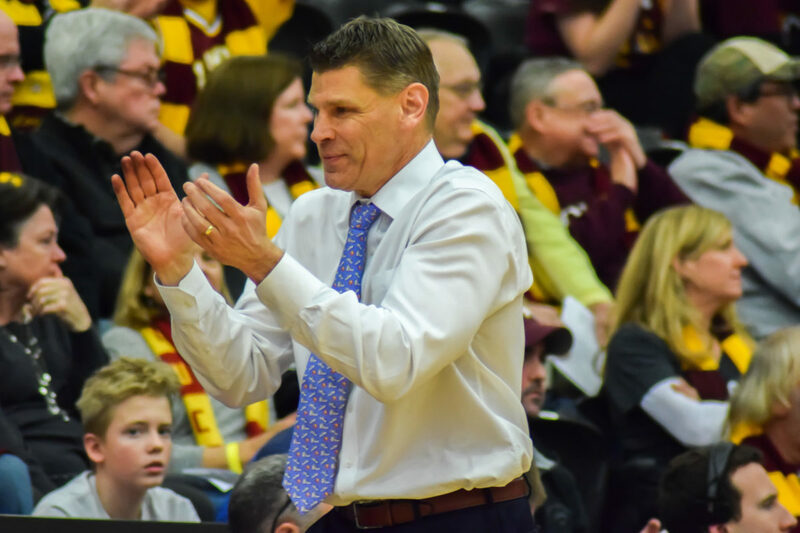 Nick Schultz | The Phoenix Loyola head coach Porter Moser reacts after Southern Illinois commits a turnover. 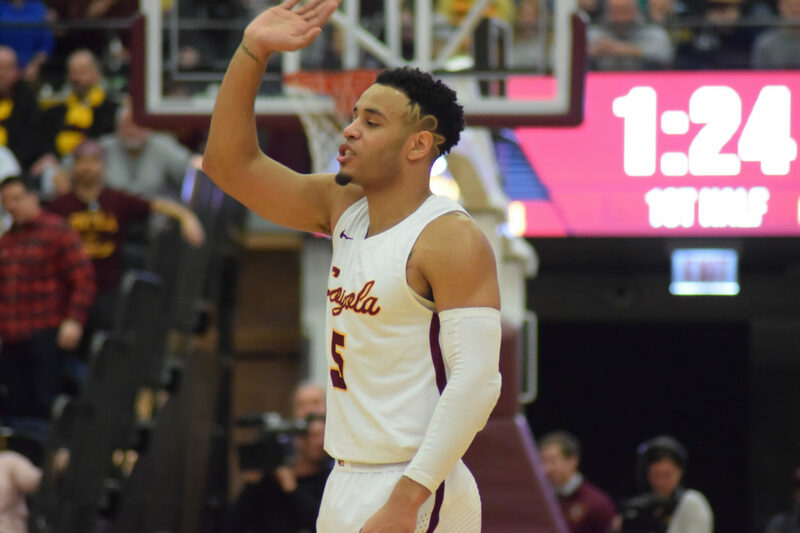 After a 70-35 loss midweek to Missouri State University, the Loyola men’s basketball team (13-8, 6-2) cruised to a 75-50 victory in a bounce-back win over Southern Illinois University in front of a packed house at Gentile Arena Sunday afternoon. The Ramblers were led by sophomore center Cameron Krutwig, who recorded a career-high 22 points and six rebounds as the big man recovered from a poor performance against Missouri State in which he failed to snag a single rebound. Redshirt senior guard Marques Townes also paced Loyola with 14 points, four assists and five rebounds in the dominant win. 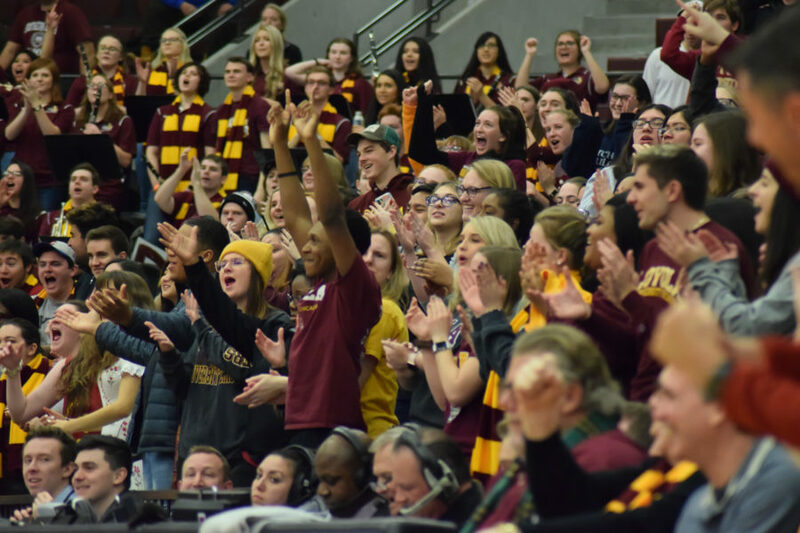 Over 4,700 fans were on hand as Loyola took sole possession of first place in the Missouri Valley Conference (MVC) after Valparaiso University fell to Drake University 70-59 Jan. 26. Through eight conference games, the Ramblers now hold a slim one-game advantage with a 6-2 record. As the MVC picture slowly starts to take shape, four games separate first-place Loyola from last-place Bradley University. Despite the tight race, Loyola head coach Porter Moser said his team isn’t dwelling on the standings at this point. 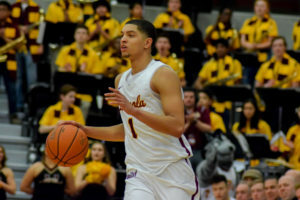 Despite the major bounce-back win, the Ramblers continued to miss sophomore guard Lucas Williamson, who re-injured his right hand in a 75-67 win over Indiana State University Jan. 19. Williamson didn’t play in the loss to Missouri State and Moser said he didn’t know what the timetable would be for his return. The Salukis, who currently sit tied for seventh out of 10 teams in the MVC standings at 3-5 were picked to finish third in the MVC preseason poll. 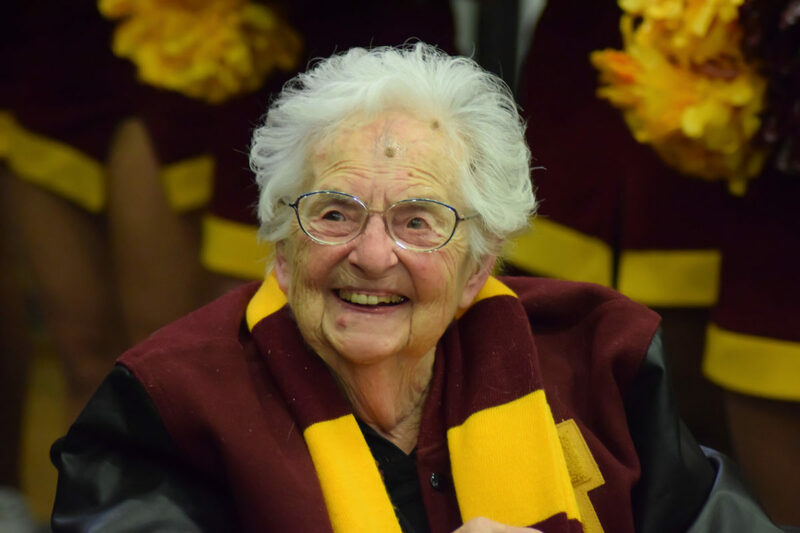 Loyola has now won its last three games against the Salukis by double-digits. Nick Schultz | The Phoenix A crowd of 4,712 people were on hand as Loyola defeated Southern Illinois 75-50 Jan. 27. Continuing a season-long trend of slow starts, the Ramblers found themselves trailing 12-7 at the second media timeout with 11:33 remaining in the first half. They would break out of this funk however, as they put together a 23-0 run over the next 6:09 and took a 42-19 lead into the locker room. The second half saw the Ramblers continue their strong shooting as they shot 61.9 percent for the half to finish the game at a 59.6 percent clip. This hot shooting carried the Ramblers to victory as they outscored the Salukis 33-31 in the final half and Krutwig and Townes each chipped in 10 second-half points. 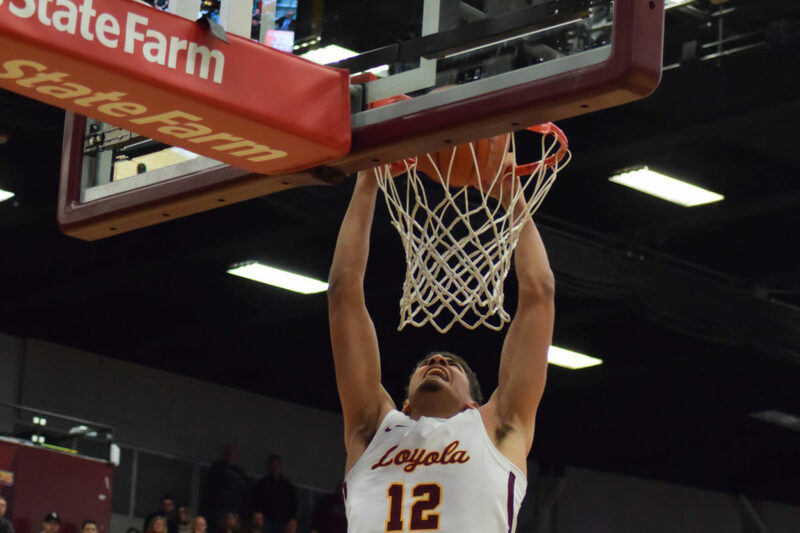 The Ramblers season is scheduled to continue Jan. 30 as they take on University of Northern Iowa at Gentile Arena in the annual “Jesuit Jam” game. Tip-off is scheduled for 6 p.m. and the game will be broadcasted on NBC Sports Chicago+.